Over the last twenty years, advanced communication technologies have become pervasive throughout Western society. These technologies have not only revolutionised the delivery of public and private services, they have shaped consumers' expectations about service quality. 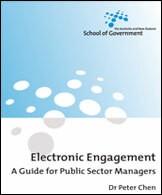 This guide (written for managers who have an interest in expanding their approach to public engagement, rather than IT professionals) assesses the value that new communications and computing technology can bring to interactions with a range of potential stakeholders. An engaging, provocative and thorough survey of available technologies and potential applications, this is a 'must read' for policy and program practitioners who are considering options for electronic engagement.